Near Cottonwood Spring, Joshua Tree National Park, California. 01 May 2010. 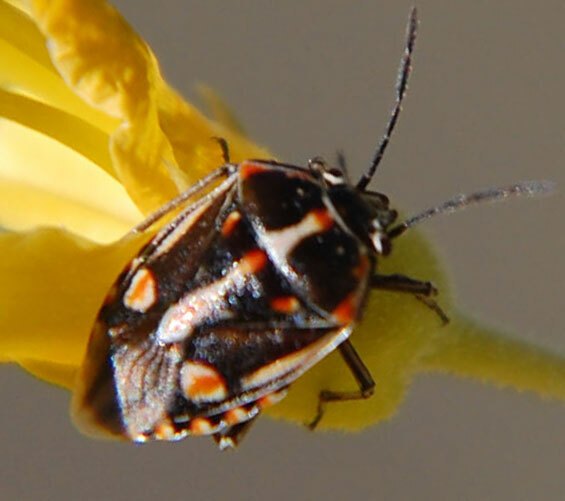 The Painted Stink Bug was first identified from specimens found near Los Angeles, California in 2008. This native of Africa and southern Europe was somehow accidentally introduced and is now spreading. The specimen at left was photographed at Joshua Tree National Park in the eastern, Colorado Desert portion. There I found it on Bladderpod (Cleome isomeris) and Desert Prince's Plume (Stanleya pinnata). This is consistent with reports that Painted Bugs have a preference for plants in the mustard family and fears that it could become a pest of cruciferous crops such as cabbage and broccoli. The Painted Bug is similar to the Harlequin Bug (Murgantia histrionica) which is also partial to mustards (Brassicaceae). The Painted Stink Bug is smaller and has a less complex pattern. It should be watched for in Arizona where it has not yet been reported?